Between 2001 and 2011, average annual employment on US crop farms (NAICS 111) covered by unemployment insurance fell from 563,600 to 531,300. Employment reported by farm labor contractors, NAICS 115115, rose from 145,000 in 2001 to 157,400 in 2011, making the FLC share of average employment on US crop farms 20 percent. Three states, California, Florida, and Washington, account for over half of UI-covered employment on crop farms and over 85 percent of UI-covered FLC employment. In California, direct-hire employment on crop farms fell while FLC employment rose, making the FLC share of California crop farm employment 42 percent in 2011. 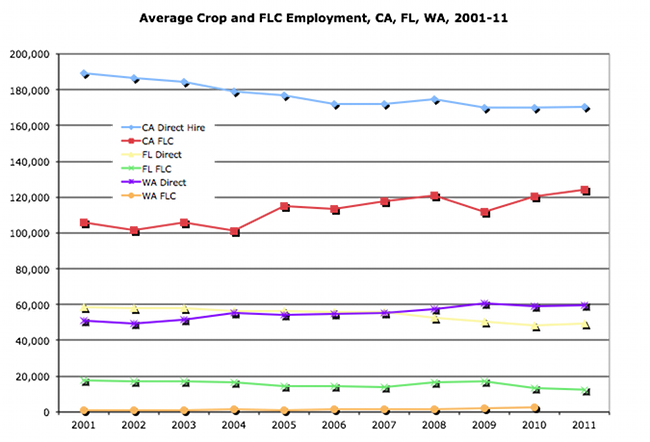 Direct-hire employment also fell in Florida, but so did FLC employment, so that the FLC share of Florida crop employment was 20 percent in 2011. In Washington direct-hire employment rose over the past decade and the FLC share of crop employment rose as well, but was still less than five percent in 2011. Federal law requires farm employers who pay cash wages of $20,000 or more in a quarter, or who employed 10 or more workers in 20 different weeks during the year, to provide UI for their employees. BLS estimates average wage and salary employment in US agriculture at 1.3 million, and says that 92 percent of US hired farm workers are covered by UI.